Mort Kunstler Handsigned & Numbered Limited Edition:"Hancock The Superb"
Image size::11 1/2" x 21"
About the Artist : So many times, he was there when decisive leadership was so desperately needed. In the Peninsula Campaign. At Chancellorsville. Antietam. Gettysburg. There, and on other bloody fields of fire and fury, General Winfield Scott Hancock distinguished himself in defense of the Union. Named for General Winfield Scott - hero of the War of 1812 and the Mexican War - he graduated from West Point in the class of '44 in time to serve under his namesake in Mexico. There he earned honors for valor in action. Further service to his country followed: in the Seminole War, in Kansas and California. When friends in uniform went South on the eve of the Civil War, he remained fully devoted to the Union. Early in the conflict he distinguished himself in the Army of the Potomac, winning praise at the Battle of Williamsburg during the Peninsula Campaign. His courageous conduct led the army commander, General George B. McClellan, to praise him as "Hancock the Superb". At the Battle of Antietam, where he commanded a division, he filled the gap of fallen leadership on the front line. At Gettysburg, he restored order among fleeing Federal troops when the first day's fighting turned against them, and his selection of defensive positions at that decisive battle was pivotal to the Federal victory at Gettysburg. He was present, too, in the final bloody fighting - at the Wilderness, Spotsylvania, Cold Harbor, and Petersburg. Throughout the full fury of the war, he displayed exceptional leadership, and made a mighty contribution to the often-battered, but eventually victorious, Army of the Potomac. At war's end he would be a hero to his Northern countrymen. But heroics were not his motivation. Foremost always to Winfield Scott Hancock was a higher calling - a determined devotion to duty, honor and country. To the men in blue who served under his command, he would always be "Hancock the Superb." Mort K�nstler's Comments General Winfield Scott Hancock has always fascinated me. What an extraordinary commander! Time after time, he distinguished himself in battle, and so many times seemed to be present to make key decisions that helped save the day and preserve the Union. He is best remembered for halting the panicky Northern retreat on the first day of fighting at Gettysburg, and selecting the defensive positions that would help save the battle, and maybe even the war, for the Union. But Hancock is remembered, and could be painted, taking decisive action on numerous occasions during the war. I have chosen to portray him as he appeared at the pivotal Battle of Antietam. During the heroic charge of the Irish Brigade on the Sunken Road at Antietam, General Thomas Meagher, the brigade commander, was wounded. So was Major General Israel B. Richardson, who commanded the First Division. 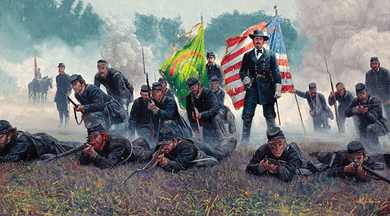 The Irish Brigade suffered a casualty rate of about 60 percent. With Meagher and Richardson gone, General Hancock rode the line to let the various brigades know he was the new division commander, and bolstered the troops with these orders: "Now, men, stay there until you are ordered away, this place must be held at all hazards!" Hancock, and the men he commanded, distinguished themselves on that bloodiest day of the Civil War. It is at this deadly and decisive moment that I have painted Hancock. It was so typical of him: courageously acting at a moment of dire need, inspiring all around him and displaying the valor that would be his trademark. In the painting, we see General Hancock; binoculars in hand, in front of the Stars and Stripes. In the left background is an aide, holding Hancock's horse as well as the red Division flag. The surviving members of New York's battered 69th Regiment have aligned in a defensive position and were fortunately not called on for any more action that day. Positioned prominently is the famed green flag of the Irish Brigade. Earlier in the war, at the Battle of Williamsburg, Hancock had earned the nickname "Hancock the Superb" for his conduct in battle. At Antietam and elsewhere, he proved that he deserved it.